The Loar is attending the Summer NAMM 2014 where they showcase their now Small Body LH-204 Brownstone acoustic guitar. Along with the updated 000-18 and OM-28 acoustic guitars, Martin & Co introduced at Musikmesse 2014 two electric-acoustic guitars. 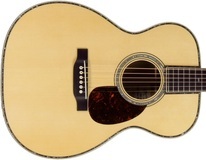 Taylor Guitars celebrate its 40th anniversary by redoing its flagship guitar series and reintroducing it at NAMM 2014.